Where are the Cottonwoods of Cottonwood Canyon? According to GeoNames, there are at least 19 places in California named “Cottonwood Canyon”, at least 18 more in Nevada, and perhaps 280 in all, nation-wide. This does not include all the places named “Cottonwood Creek,” “Cottonwood Wash,” “Cottonwood Spring,” etc. One of these Cottonwood Canyons is in the Bodie Hills, just south of Bodie. Many visitors to Bodie come or go via the Cottonwood Canyon Road, which meets State Route 167 just north of Mono Lake. 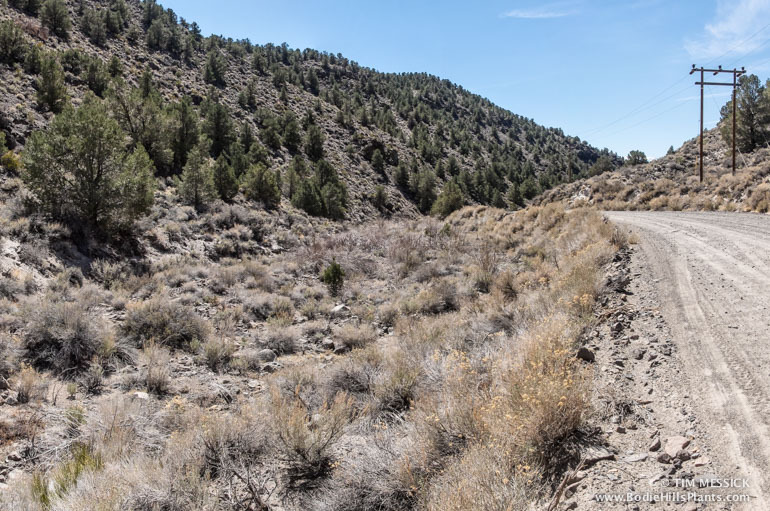 This is one of the oldest and historically most used routes into Bodie. Presumably all places named Cottonwood Canyon have now, or had at some time in the past, a species of cottonwood (Populus) growing in or near them. But where, now, are the cottonwoods of this Cottonwood Canyon, here in the Bodie Hills? 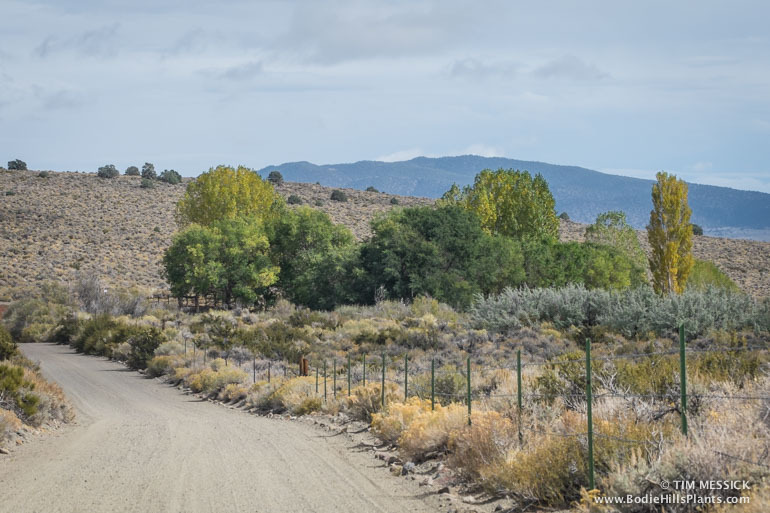 On a casual drive through, you will see pinyon pines and Utah junipers on the hillsides and occasional willow thickets along the creek. There appear to be 3 different cottonwoods (white, Lombardy, and Fremont) growing at Flying M Ranch, where the creek from Cottonwood Canyon crosses Dobie Meadows Road, but these are probably all planted, and these are below the mouth of Cottonwood Canyon. There are no cottonwoods in Cottonwood Canyon, that I can find. If they’re all gone, what happened to them? My guess is they succumbed to the axe and saw even before 1890, because wood of any kind was scarce near Bodie and in high demand for building, heating, and shoring up the mines. And again, this was right along a main road into Bodie. Perhaps, also, the water in this canyon wasn’t enough in historic times to support very many cottonwoods. Which cottonwood might have been here? Maybe black cottonwood (Populus trichocarpa)? It’s common in canyons along the eastern Sierra Nevada, including the Sierran streams that enter Mono Lake. It’s on lower Bodie Creek and at Fletcher on the east side of the Bodie Hills. It was collected on September 7, 1932 by L. E. Hoffman, at “Mono Lake Region – road to Bodie” (see the specimen record). 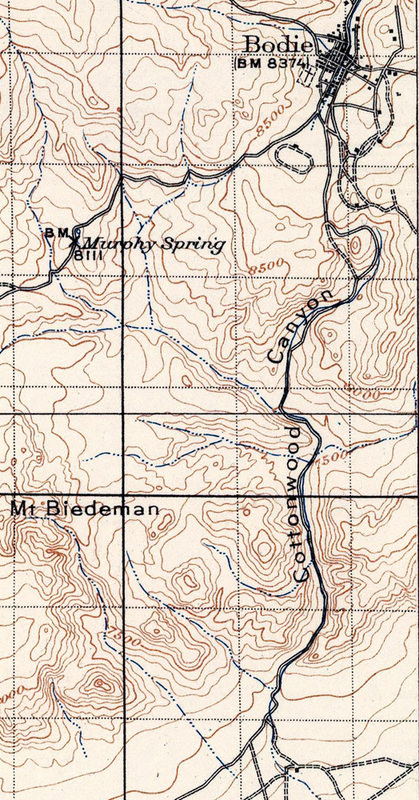 This was more recently mapped at a location along Coyote Springs Road (in Bridgeport Canyon), but I think “road to Bodie” in 1932 could more likely refer to the road in Cottonwood Canyon. Or maybe Fremont cottonwood (Populus fremontii)? This tree is scarce in the Mono Basin, but it’s found in some east-side valleys watered by rivers north and south of here. There are some along the East Walker River north of Bridgeport. 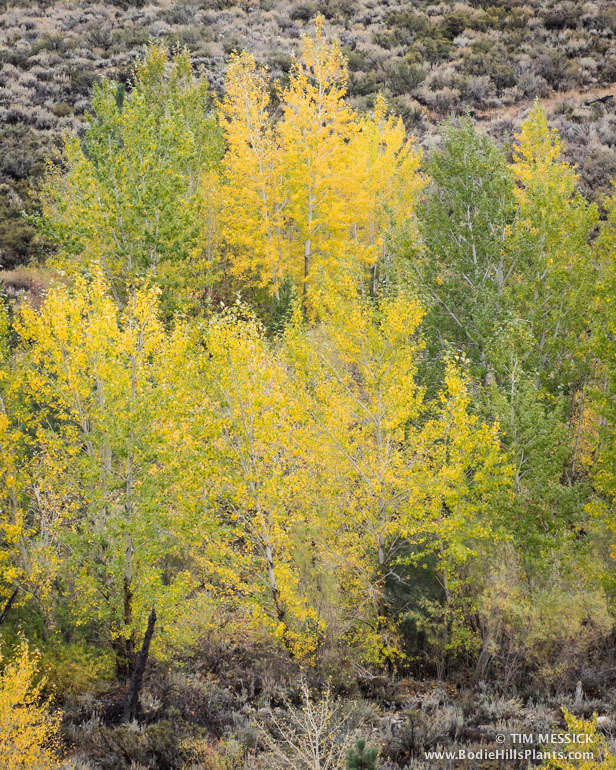 The trees in Cottonwood Canyon would not have been aspens (Populus tremuloides), because aspens are never called “cottonwoods” and aspens in the southern Bodie Hills grow at higher elevations. 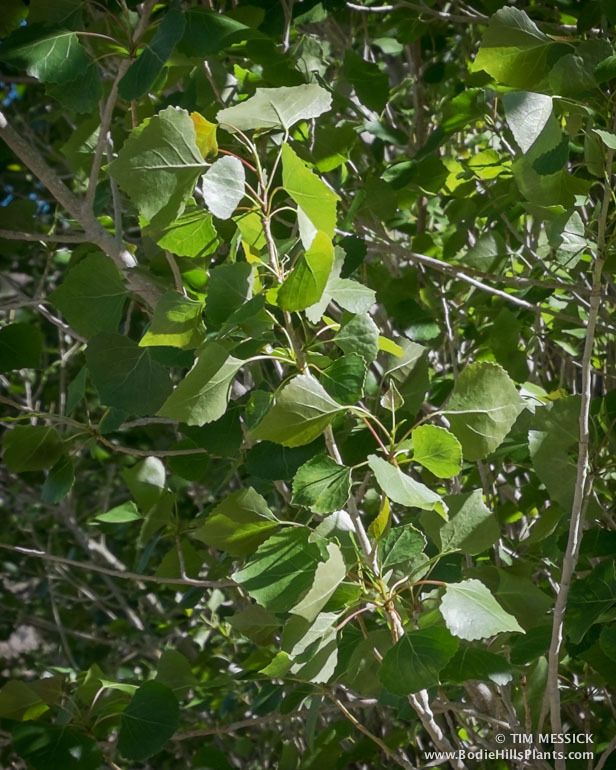 It’s unlikely they would have been the European cottonwoods that were planted by early settlers at settlements in the Mono Basin and Bridgeport Valley—white cottonwood (Populus alba) and Lombardy poplar (Populus nigra ‘Italica’). There are no settlements or ranches in Cottonwood Canyon, other than Flying M Ranch, which is along this drainage but well south of the canyon itself. I’ll cast my vote for black cottonwood. 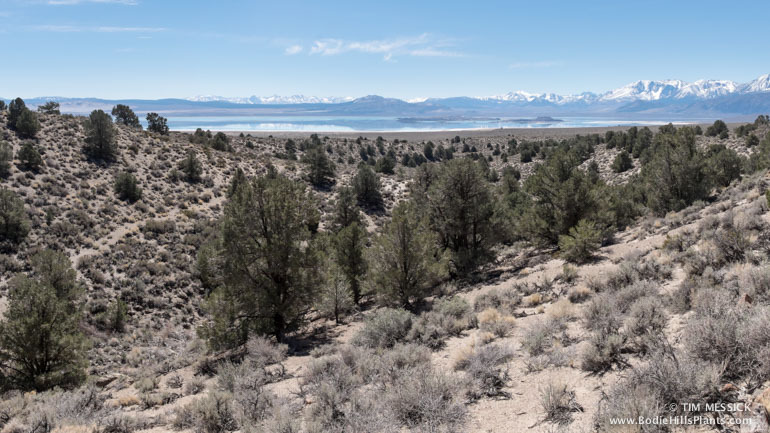 The elevation and habitat in Cottonwood Canyon are similar to where black cottonwoods grow today elsewhere in the Mono Basin and on lower Bodie Creek. During times when the climate averaged just a little cooler and wetter than now, black cottonwoods may well have grown here. Closer examination in the field might offer a bit of old wood as evidence.